Who gets to influence the climate negotiations? The influence of fossil fuel corporations was strongly questioned by developing countries in the post-Paris meeting of the climate change negotiations in Bonn last week. A number of developing countries, led by Ecuador, Guatemala and Bolivia are now calling for concrete measures to define how the public policy making process interacts with the private sector in climate change negotiations. What they want is special attention to be given to concerns over potential conflicts of interest between the industry and the implementation of the Paris Agreement. Many business communities and the media too are actively engaged with climate change issues all over the world. Having their views heard and considered by negotiating Parties is not necessarily a bad thing. However, concerns are being voiced about the undue influence of the fossil fuel lobby, which yet has to prove whether it is willing to align its polluting business models with the agreed goal of keeping global warming below 1.5°C. According to Jesse Bragg of Corporate Accountability International, (CAI) one of the key concerns is that there is already a welcoming place for groups and corporations representing the fossil fuel industry, but that the Paris Agreement takes it a step further. It extends an invitation for the private sector to get deeply engaged and involved in climate action. The Break Free campaign, that engaged thousands of citizens all over the world last month (May), added pressure on governments to do their best in order to strengthen the commitments they made in the Paris Agreement, ensuring that its implementation is not directed to false solutions. For Bragg, “climate action should be based on the interests of citizens and the planet, not those of the industry. The private sector will definitely have a role in climate action. The question is whether it is also going to be allowed to write the rules for it”. Developing countries and civil society believe that sound climate policy affects the profits of the fossil fuel industry and so there must be a process in place, by which the legitimacy of the UNFCCC will be protected. This should make sure that conflicts of interest with the private sector are avoided. “These are the same companies that, for decades, have undermined attempts to find solutions to climate change, although they knew of its existence for so long. Now that they are singing a different tune, we cannot just allow our memory to fall short,” reminds Bragg. The process leading to Paris has been a 20-year negotiations, largely due to their opaque ways of doing things. “We should be able to make the distinction between the PR that certain corporations are putting out, and what their true intentions are. If their business models are predicated on extraction and burning fossil fuels, negotiators should ask themselves whether they really have a role that is consistent with the interest of this convention,” Bragg adds. For civil society such as CAI that seems doubtful and until that changes, there’s a good argument to say that they should not be considered as stakeholders in the negotiations. But this does not seem to be the case. French energy giant Engie, for example, was one of the sponsors at COP21. The corporation owns 30 dirty coal plants and, unsurprisingly, they were in there Paris to say that renewables are not the answer. Feelings ran strong last week and in the closing Plenary of the Subsidiary Body for Implementation of the UNFCCC, representatives of more than 75 Global South countries banded together to challenge Global North governments and the SBI Chair himself for unceremoniously silencing their voices. 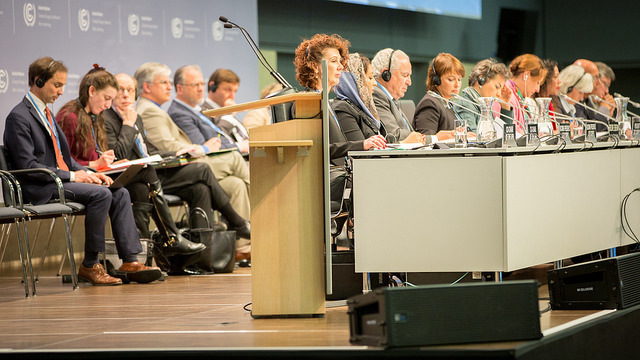 Once again, countries proposed that the UNFCCC begin considering the process of creating common sense measures to ensure that the UNFCCC is safeguarded from the interests of the fossil fuel industry and others advancing its agenda. And, once again, the US, EU and others blocked their requests in the name of protecting their country’s’ fossil fuel industry interests. It is unacceptable but unsurprising that a much smaller proportion of Parties, who represent some of the biggest polluters in the World, continue to stand in the way of progress. Led by Ecuador, there were Parties who refused to accept bullying from both the Chair and the countries trying to silence them and vowed to bring the issue up in future meetings. The fossil fuel industry has no interest in ambitious climate policy and it is using its access to Global North governments to stymie action at all levels. If we are to slow warming to remain below 1.5 degrees Celsius, we must first acknowledge the barriers in the way. And, some of the largest of those barriers are most certainly Big Oil, the rest of the fossil fuel industry, and those countries that continue to do their bidding in this space. It has become clear that what is needed in these negotiations instead, is a platform for the exchange of experiences and sharing of best practices on mitigation and adaptation in a holistic and integrated manner. This should aim to strengthen knowledge, technologies, practices and efforts undertaken by communities of practice all over the world. With the present gap in relation to the effective participation of indigenous peoples and local communities in the engagement of observers, the private sector should not get an “access all areas” in decisions so important for the future of humanity on Earth. Co-authored with Renee Karunungan and Anna Pérez Català, first published on The Ecologist.